PARIS. Such is the witty title of a recent side event organized by the Confederation of Finnish Industries at the climate conference (COP21) in Paris. Despite the clearly humoristic tone, the question is a serious issue in the discussions. Forest was the first topic of the Lima-Paris Action Agenda (LPAA), a parallel forum to the COP21 which seeks to enhance climate engagement in both public and private sectors and show the decision-makers how the different actors can contribute to the green transition. “There’s no climate change solution without forests”, said Felipe Calderon, the Former President of Mexico, at the LPAA. Currently, 12 million hectares of forest carbon sinks are lost every year, which accounts for 11% of the greenhouse gas emissions globally, numbers which reflect the central role of forests in a possible climate solution. Although there is a net loss of forest, the trend is not global. Rather recent years have shown a decrease in forest coverage in the southern hemisphere while the forest resources in the northern hemisphere have grown and sharing the experience and know-how of forest management in the northern region might therefore benefit the climate mitigation. The Nordic countries play an important role as forerunners for sustainable forestry. Finland is the most forested country in Europe with a total forest coverage of 76%, exceeding its Swedish neighbour by one percent unit. The abundance of forest resources has not only been the base for its industries but it has also provided an opportunity to advance sustainable development in the region. “In Finland forestry offsets 30-60% of the emissions from other sectors”, says Heikki Granholm from the Finnish Ministry of Agriculture and Forestry, noting that the forest provides an important carbon sink in the region. Bioenergy from forest resources is also recognised as a key source of renewable energy and accounts for 80 % of the renewable energy in Finland. Sceptics note that the use of forest resources will inevitably reduce the carbon stock of the forest. However, Björn Boström, from the Swedish Environmental Protection Agency, maintains that as long as the growth is greater than the felling, the forest will be sustainable. It should also be noted that the use of wood products replaces other fossil and high energy and thus reduces the total carbon emission. Bioenergy has flourished also in Sweden, where the sector has grown from 60 TWh in 1990 to 128 TWh in 2013 and now makes up 34% of the total energy supply, exceeding the nuclear energy supply. “We have to remember that when we speak of solar and wind power, this is electricity, which is only a small part of all renewable energy”, says Joona Turtiainen from Finnish Energy, noting that many people often oversee the importance of bioenergy. The sustainable use of forestry is also a sector that the Finnish government wants to develop further and the bioeconomy plays an important role in its future policies. “It has great potential for moving to a new economic stage where we use no non-renewable resources”, says Granholm. Despite the positive development in bioenergy, the low price on fossil fuels has made it difficult for bioenergy to provide a competitive alternative on the market. “The fossil competitors are so ridiculously cheap that the economy is restricting the use of biomass”, says Antti Asikainen, professor at the Finnish Forest Research Institute. This is confirmed by Boström who notes that the carbon tax has been very important to increase the use of bioenergy. Considering the importance of the forest carbon sink, the accounting of its mitigating impact in a future climate agreement would have a large impact on the official emission levels. “The emission impact of forestry is almost as high as all other sectors in Sweden”, says Boström and Sweden is now developing its position for the inclusion of LULUCF in EU’s post-2030 climate framework. Turtiainen agrees that clear rules are needed for the inclusion of forest emissions in the carbon accounting, but doubts that there will be any such decision during the ongoing conference in Paris. A new report on the role of forests in the EU climate policy was launched at a seminar by the European Forest Institute at the COP21 earlier this week. According to the report, forests currently absorb 13% of the EU CO2 emissions, but the findings suggest that the number could increase to as much as 22% by 2030, if the member states were sufficiently incentivised. While there is a positive development in forestry in the northern hemisphere, much needs to be done in the global south. The LPAA announced the commitment to create partnerships for ensuring sustainable forest use, for which an additional support of billions of dollars will be provided. Norway promised, jointly with Germany and the UK, to provide more than $ 5 billion by 2020 to support reforestation and conservation projects if countries show a serious engagement with the REDD+ programme. 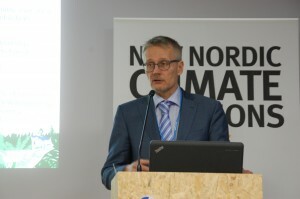 “Reducing deforestation and restoring forests can deliver nine gigaton per year in terms of greenhouse gas mitigation, hence it can substantially contribute to solving our problem”, said Dr. Karsten Sach, the German chief negotiator, who presented the ambition of new financial contributions by Germany, Norway and the UK. Many leaders also underlined that the new climate treaty must advance the REDD+ scheme, through which financial incentives are offered to developing countries that enhance sustainable forestry and work to prevent deforestation and degradation of the land.